Our range of products include single distiller glass. Our company is engaged in manufacturing and supplying of Distiller Glass/Quartz. This is a distiller for producing distilled water for loboratory research. With distillation process, water is boiled upto 100 deg C to produce vapour and this is again converted into liquid state by condensation. This steps is repeated several times to reduce the contaminants from the water completely. 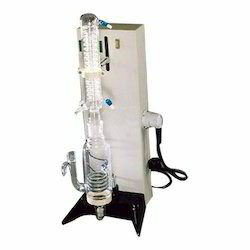 Gas Purification System segreggates harmful contaminants upto a level exceeding research grade quality (99.9995) when starting with standard grade compressed gases. The purification system consists of total two cartidges in series to reduce column-damaging impurities such as sulphur compound, moisture, dust, oil & hydrocarbons to vanishingly low levels. GHS-PLUS comprises an inlet pressure gauge, toggle valve, 11" moisture trap, 11' hydrocarbon trap, pressure regulator, outlet pressure gauge. Looking for Distiller Glass ?